Three rare Australian coins have fetched almost $900,000 at auction - taking out two records in the process. Australia's first coin, known as the 'Hannibal Head' Holey Dollar, sold for $410,000, while the first gold coin, an 1852 Adelaide pound, netted $370,000. Both coins fetched record prices for coins of their type sold at auction, with the pound eclipsing the previous record by $240,000. The coins went under the hammer in Melbourne on Monday night along with an 1813 Colonial Dumps coin, which had a less impressive result, selling for half the estimated price at $100,000. Coinworks managing director Belinda Downie said it was an exciting auction result. 'It was a win-win. The vendor's happy. I saw really beautiful quality coins sell for very exciting prices, so, from a Coinworks perspective, and an industry perspective, there are no complaints,' she told AAP. 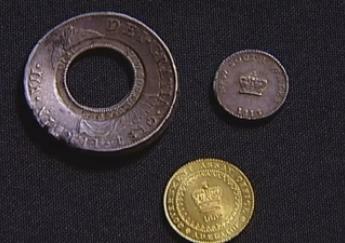 The top selling Holey Dollar is the only one of its type in private hands, with the only other known example housed in the NSW State Library. 'This one is unique for private buyers,' Ms Downie said. The Holey Dollar was created from 40,000 Spanish coins acquired by Governor Lachlan Macquarie to alleviate Australia's coin shortage. Governor Macquarie enlisted the services of convicted forger William Henshall to cut a hole in the centre of each dollar and later to stamp each with the words New South Wales and a five shilling value. The rare coin gained notoriety after being found in 1881 as part of a bushranger's hoard and was later owned by the Tasmanian governor, Ms Downie said. 'Right from the onset this particular coin has always enjoyed publicity,' she said.